A wonderful and very practical summary of St. Louis Marie de Montfort's True Devotion to Mary. This saint's plan for the perfect fulfillment of our Baptismal Vows is the devotion we know as Holy Slavery, wherein we give all we have and are to Jesus through the hands of His Immaculate Mother. Saint Paul tells us: “Whether you eat or drink, or do anything else, do all for the glory of God” (1 Cor. 10:31). 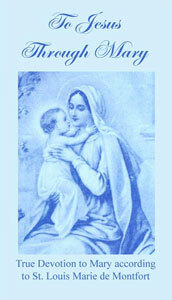 In a servant of Mary everything should be holy, even the partaking of food. With what holy sentiments must not Mary have taken her meals in the company of her Divine Son and good St. Joseph! St. Gertrude, whenever she partook of food, said this beautiful prayer: "O Lord, I take this food in union with that love in which Thou hast from eternity destined it for our nourishment and in that love in which Thou didst sanctify it, when in Thy humanity Thou didst partake of the same, for the honor of Thy Heavenly Father and the salvation of all mankind." At every meal let us practice some slight mortification for love of Mary. God in His love for us wishes us to relax at times from our labors. But how often are not God and our neighbor offended in even lawful forms of amusements! A true servant of Mary will also think of her during his recreations. He will guard well his eyes and his tongue, that sin may not enter through unrestrained senses. What love, what goodness and modesty did not Mary manifest in her conversations! Imitate this beautiful model. When possible, try to introduce a few words about the Blessed Virgin into your conversation.